LiveWire Energy Explosive Marketing News! LiveWire Energy had a Awesome special this week! Free LiveWire to Everyone Just visit the Website and enter a code. Bill offered 300 to the first 300 people...... Well Thanks to the Social marketing and Videos made this deal took off like the Space Shuttle!! Seriously.... This is one of the most Amazing and Successful Marketing Campaigns EVER Embarked upon.... Not just by Livewire but by any company I know of. This deal Quickly became all about something else and Thanks to our new YouTube & Facebook "Mod Squad" I believe we are going to really Crank out some content and get it out there in a way that will help out in a HUGE way!! Want to read the whole story?? Thanks for reading up make sure and Subscribe to all of our pages on Facebook and YouTube. We have some more Awesome things planned and we will be making more Awesome content & HUGE Deals that Build awareness to drive sales. Click the Picture below to add us on Facebook. Participating in a G+ Hangout or YouTube Livestream can be Confusing! Here are some tips PLUS Direct links and a description of how they go down so you can follow along from ANYWHERE even from your Android or iPhone. Also If you have headphones or a headset we may even open it up for LIVE Video Questions & have you on the show. #1 Watch Google Plus Hangout! #2 Watch on YouTube Livestream! To do it this way follow the above Instructions and Then use the Link Below to see the Livestream on YouTube and Fee Free to Comment Away and Please "Like" The Video While you are there!!! There really is No wrong way to do it whichever you Prefer. However we prefer to have you involved in the comments and such so Hope to see you there!! Stars of the LiveWire Commercial to be announced!! If you did NOT see this Video Make sure and Check it out!! Great News and Lots of Action from Bill Hodson CEO of Livewire Ergogenics! We are Extremely Excited to Bring you this Google Hangout and Livestream about Probiotics! This will be a place where you can quickly learn the basics of Probiotics & learn how the Affect you and Why Top Researchers are saying they are very important far many of us in many ways! The best Place to watch is YouTube here is a Direct link. Make sure and drop by Kick your shoes off Relax and By all means if you would like to Participate there will be a Live comment feed where you can ask questions. This will be our first Livestream like this and I hope you enjoy. To find out more about Dr. Judy Staveley add her on Facebook for some Great posts! Also make sure and Add 7 day Probiotic on Facebook! Also HERE is the New Video of the week. 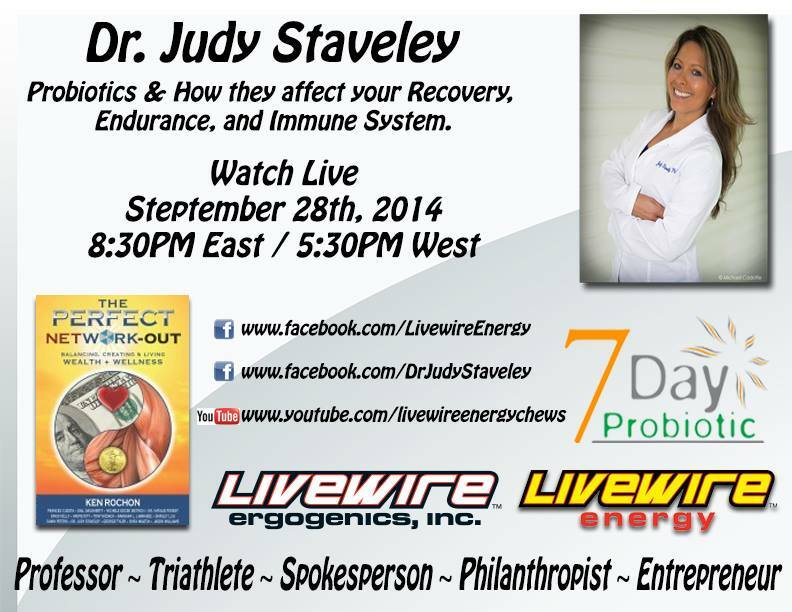 Dr Judy Staveley Health & Wellness Interview & Live Video Broadcast. Livestream Hangout on G+ with Dr. Judy Staveley. We will Update all the Details and the Event Page for the Stream to a New Page on this Website mid week. Make sure and Add us on Facebook to stay Up to date!! This week we have a VERY Special Guest Speaker! for a Livestream Dr. Judy Staveley, Ph.D. Will be on the Hangout with us to tell us about Some very Important Health Issues and how to Avoid, Overcome or Deal with if it is a ongoing thing. Some of the Topics We believe will be covered are below but we would LOVE to have your input for a Few Things if you have any. This is a List that Will be perfected by mid week. We feel it would be Nice to Give Subscribers, Distributors, Stockholders, Clients and just Anyone who is or wants to be healthy to get in some of the Questions they may have.... Here we go. Here is the Video from last week Check Back here Tonight for more,. Pro-Biotics ~ by Dr. Judy Staveley, Ph.D.
Probiotics are live microorganisms that can be found in yogurt or in several dietary food products. These little beneficial live bacteria are similar to those found in your stomach. We know them as normal bacteria or normal flora. We have over a trillion of little bacteria living in our bodies that help our immune system fight off bad bacteria. As a Professor in Biology and an athlete I am exposed to potentially harmful bacteria everyday, just like everyone else who is exposed to crowds or potential environments. Enhancing your diet with probiotics can boost and protect your immune system and your digestive system. With everyday life stressors or illnesses, our bodies tend to loose normal flora and the unbalance of these bacteria tends to support unnormal growth. By maintaining probiotics in your diet, you will help recolonize your (GI) tract, digestive system, gut and intestines. This will help also absorb nutrients more efficiently. Probiotics should not be confused with prebiotics. Probiotics can be found in items such as Live Wire drinks, yogurt, capsules, powder and other supplement forms. Probiotics is a friendly bacterium that can be consumed in these types of foods. Research studies have shown scientific evidence that probiotics help with lactose intolerance and improvement in digestive problems. Many probiotic strains exhibit anti-inflammatory properties according to several published journals. Promising research for the use of probiotics done by the National Institute of Health have shown to help with infections such as respiratory, allergic diseases, tooth decay, nasal pathogen, and gastroenteritis. Probiotics cultures found in 7 Day Probiotic can restore the bacteria imbalance within the gut. Most doctors would agree, that there is no good reason not to take probiotics when taking prescribed antibiotics. Self-dosing with probiotics is an estimated 100 trillion microorganisms representing more than 500 different species inhabit every normal, healthy bowel. These microorganisms (or microflora) generally don’t make us sick, they are usually more helpful to our systems. Gut-dwelling bacteria keep pathogens (harmful microorganisms) in check, aid digestion and nutrient absorption, and contribute to immune function. Order Dr. Judy Staveley's New Book! Antibiotics are usually taken for bacterial infections such as streptococcus. Unfortunately, the antibiotic can kill the normal flora / normal bacteria in our gut leading to diarrhea. Viral infections and other bacterial infections can result in symptoms of diarrhea. The best case for probiotic therapy has been in treatment of diarrhea. Probiotic therapy may also help people with Crohn’s disease and irritable bowel syndrome. Clinical trial results are mixed, but several small studies suggest that certain probiotics may help maintain remission of ulcerative colitis and prevent relapse of Crohn’s disease and the recurrence of pouchitis (a complication of surgery to treat ulcerative colitis). The draw back of probiotics is that the FDA does not regulate them. They are considered a dietary supplement. Probiotics cultures found in 7 Day Probiotic can restore the bacteria imbalance within the gut. Most doctors would agree, that there is no good reason not to take probiotics when taking prescribed antibiotics. Scientist found that probiotic doses of more than 5 billion colony-forming units per day for adults are considered to be the best outcome. Here is a Link to her Book where you can Purchase it. Make sure and "Like" Dr. Staveley on Facebook! Try Any 7 Day Probiotic product This Week & get a FREE 4-Pack of LiveWire! New Probiotics Blog & Probiotics Expert Guest Writer! It is with GREAT Pleasure that We introduce to you one of the Best & Longest Supporters of Livewire to this Date!! Dr. Judy Staveley! She has Pretty much been around since the Start of LiveWire Energy (LVVV) She is Sponsored in Sports by Livewire but Little did I know she was actually a Professor & Micro Biologist who Teaches and Writes on Probiotics. After seeing her posts for Years we are Excited to have her on Board here at LiveWire Ergogenics as a Guest Writer here at 7 Day Probiotic as well! Check out some Information below about Dr Judy and Even Order her Book all the links are below. Special Probiotic Article Tomorrow by Dr Judy Staveley Ph.D. Here are Links to some of her other Ventures. 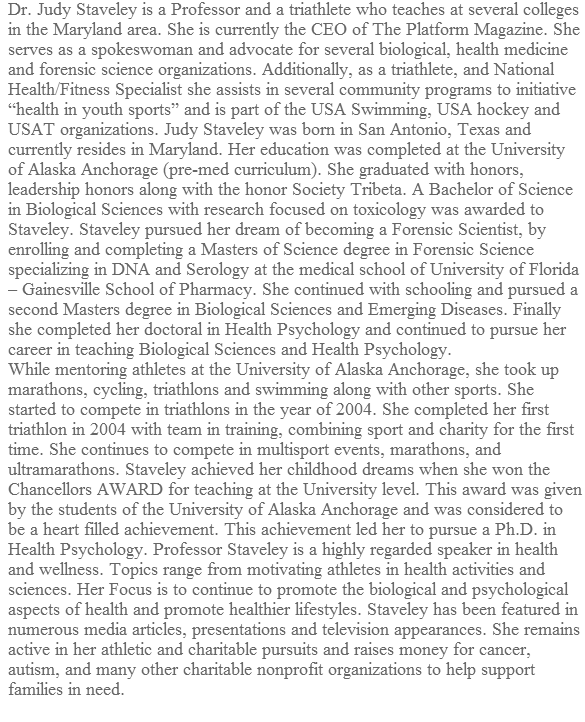 Dr Staveley is Quite Active and there is A LOT of Information out there she has Published or been published in! Thanks for reading and there will Be New content here in the Next 36 Hours or so as we can get it up! Thanks and Make sure and ADD us on Facebook!